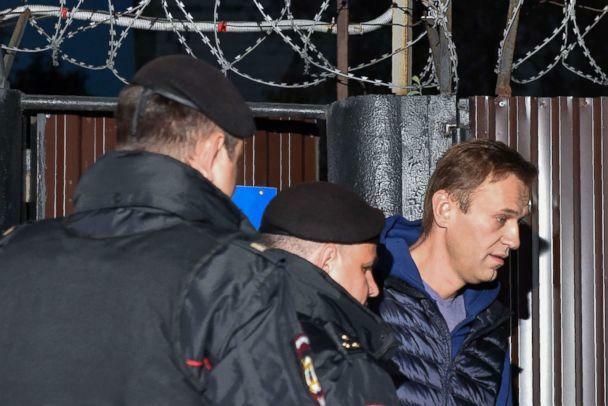 Russia's most prominent opposition leader, Alexey Navalny, was released from jail on Monday and then immediately arrested again and sentenced to another 20 days of detention. 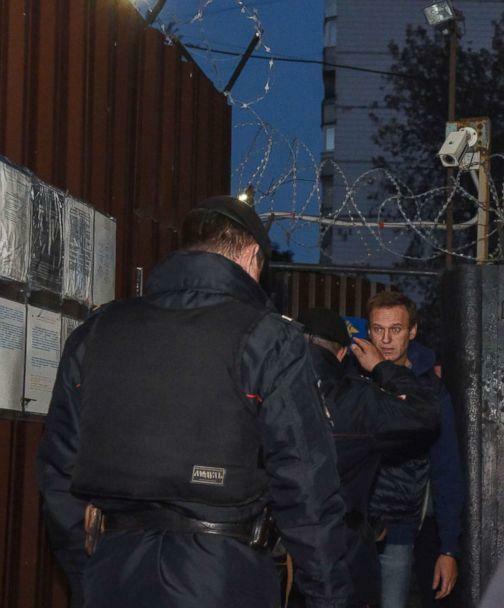 Navalny was met by police officers at the door of a Moscow detention center as he stepped out of jail after serving a 30-day sentence for organizing an unauthorized rally. He was immediately taken to a police station, and, late Monday evening, a court sentenced him to 20 additional days in jail after convicting him of a new protest violation, his spokeswoman, Kira Yarmysh wrote on Twitter. Navalny, 42, has become the best-known face of Russia's anti-Putin opposition and has been arrested regularly as he and his supporters have staged demonstrations criticizing the lack of political freedom and alleged corruption under President Vladimir Putin. The court convicted Navalny of causing harm to a person or property resulting from his "action or inaction" during a demonstration he called for on Sept. 9 as part of nationwide protests against a plan to raise Russia's pension age. The harm alleged by the prosecution was that during the protest, which saw hundreds of people arrested, a police vehicle's paintwork was scratched by demonstrators. Navalny himself was not present at the demonstration because he was already in jail, but police claimed he was responsible for the alleged damage since he had called for the protest to go ahead as planned. Navalny accused the court of fabricating the case against him and said it was doing so in order to lay groundwork for a far more serious criminal case against him that could see him jailed for up to five years. "You are just inventing a case, you are completely brazenly fabricating an administrative case, which is a step towards fabricating a criminal case," Navalny told the judge, Elena Armyzshina, according to the Russian site, Mediazona, which was in the courtroom. Navalny was arrested the last time in August shortly before the Sept. 9 protest. He was jailed then on charges relating to a demonstration organized in January close to the Red Square. Police at the time said it had taken them until August to charge Navalny because they had been unable to locate him, despite the fact that he had spent much of May in police custody after being detained for a different demonstration held on the eve of Putin’s inauguration for a fourth term as president. Navalny has said the arrests are intended to disrupt his protest activity. He has spent 120 days in detention since 2017, according to Yarmysh, his spokeswoman. Most recently, Navalny had been calling for protests against the controversial pension reform that has attracted unusual public discontent in Russia and which has taken a toll on Putin's approval rating, which dropped from close to 80 percent in May to 67 percent in July, according to an independent polling agency, the Levada Center. Navalny's supporters have staged a number of relatively large anti-Kremlin demonstrations across Russia in recent years, which are usually broken up by police. He has built a grassroots following, particularly among younger Russians, in part through video investigations into the alleged ill-gotten wealth of senior officials. Two weeks ago, one of the subjects of these investigations, the head of Russia's National Guard, Viktor Zolotov, released a video address in which he challenged Navalny to a duel and promised to make "a juicy beefsteak" of him after the activist alleged there was large-scale corruption in the organization under Zolotov. The Kremlin has said Navalny's protests violate a law requiring rallies to be authorized and has called Navalny a criminal. 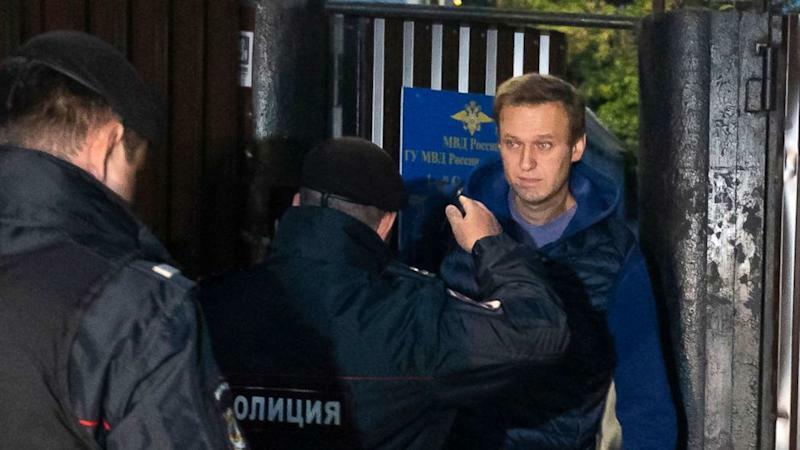 Navalny was sentenced to a five-year suspended sentence in 2013 on fraud charges that he says are trumped up and designed to prevent his running for office. The conviction was used in 2018 to bar him from taking part in this year's presidential election.